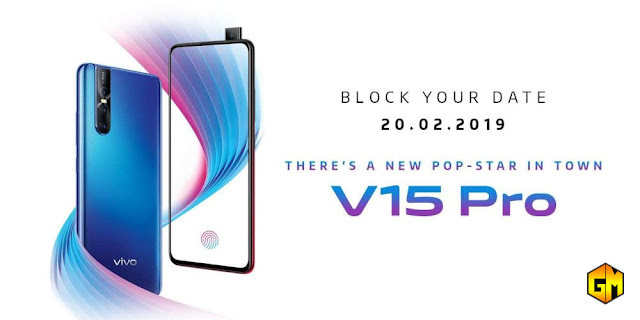 Home / android / pop up camera / selfie / smartphone / vivo / Vivo V15 to launch on February 20 in India. Vivo V15 to launch on February 20 in India. Its been a rumor in the previous week that Vivo will come out something new this year. And the rumor has been spread on social media, Few pictures are also posted on Twitter and Instagram. But few days ago the rumor and speculation has been ended as the Vivo officially announced the company next level smartphone, the Vivo V15. According to the leaked photos, the Vivo V15 will feature a triple camera setup on the rear with a massive 4MP main cam while the selfie camera has the 32MP pop up cam that is first seen from the Vivo NEX. The new V15 series will also cater the under display fingerprint sensor. Vivo is set to launch the V15 and V15 Pro on February 20 in India. For the complete specification of this new devices you may proceed to this LINK. We still no news about pricing of this new devices but we love to see the Vivo V15 match the price point of the previous V11 phone.